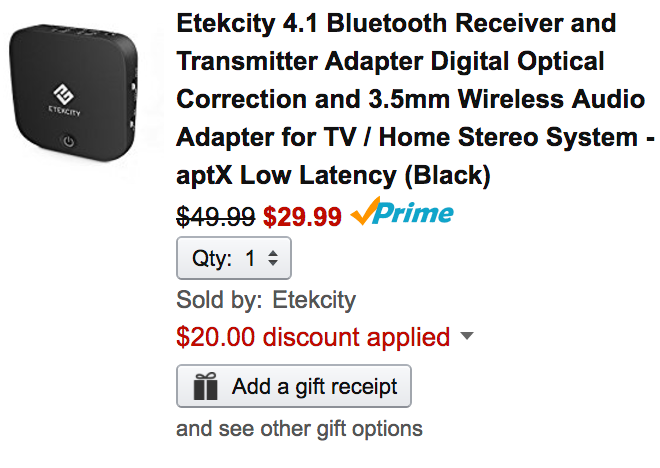 Etekcity (99% positive feedback from shoppers) via Amazon is offering its Bluetooth Receiver/Transmitter with Optical (SPDIF) for $49.99, but if you use the code 8ERM3WE3 the price drops to just $29.99 Prime shipped. That’s $20 off the regular price and the lowest we’ve seen it offered at Amazon. You can use this adapter to pair with two headphones or speakers at once. It has Bluetooth 4.1, support for 3.5mm and even Toslink Digital Optical Audio. Rated 4.4/5 stars by over 1,600 Amazon shoppers. Effortless Setup to Easy Enjoyment The EA-TR1 Bluetooth Transmitter and Receiver Adapter will meet the everyday demands of home video and audio devices. It supports a variety of audio connections, including Toslink Digital Optical Audio cables, which expands your connectivity capabilities. The adapter will enable your traditional earphones with the latest Bluetooth 4.1 for wireless audio streaming with the latest Bluetooth devices. And by using aptX Low Latency technology, the adapter transmits audio synced to the images displayed on your TV screen with reduced audio delay latency of 30-40 milliseconds.